It’s that time of year again when the cold virus rears its ugly head. Cold season usually lines up with the start of the new school year and can begin as early as late August, early September. It’s also that time of year when pollen counts peak. Ragweed is the biggest allergy trigger in the fall; it can begin to release pollen in mid-August and usually peaks the first of September. The constant runny nose, cough and scratchy throat can make it difficult for kids to focus in the classroom. But many parents are left wondering, does my child have a cold or is it seasonal allergies? One of the most differentiating factors is the length of time a child suffers from symptoms. Colds normally run their course in a week or 2, whereas allergy symptoms can last the entire season, sometimes as long as 4 to 6 weeks. In addition, the rate at which symptoms appear is another strong differentiating factor. If it’s a cold, the symptoms seem to come on quickly. 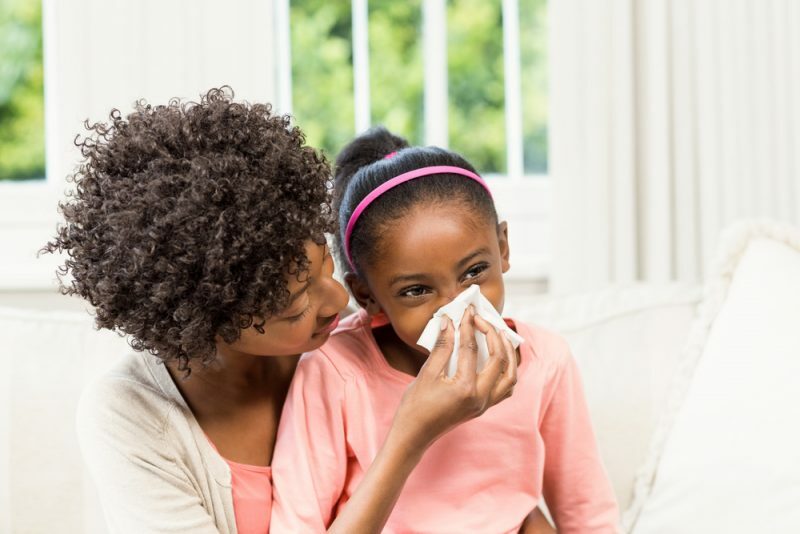 A cold may start off with a sore throat and stuffy nose, and then 2 days later your child’s coughing, constantly blowing her nose and feeling run down. When it comes to allergies, symptoms tend to gradually get worse over a couple of weeks. When kids catch a cold, they usually have fatigue and body aches, sometimes even a low-grade fever. Allergies rarely, if ever, elicit these symptoms. The telltale signs your child has seasonal allergies are itchy eyes and nose, which most kids don’t experience when they have a cold. The chart below lists typical symptoms for colds and seasonal allergies. Taking stock of your symptoms and how long they last will help you determine what’s causing your child trouble. It’s important to understand the difference between colds and seasonal allergies to appropriately treat your child’s symptoms. What’s more, a cold is contagious, so it’s crucial your child frequently washes her hands and coughs/sneezes in the crook of her arm to stop the spread. The main treatment for a cold is making sure your child gets extra rest and fluids until it runs its course. Decongestants, cough medicine or acetaminophen for aches can help ease discomfort. However, it’s important to note cold medicines should not be taken together to avoid accidental overdoses. Treatment for seasonal allergies is different. Antihistamines, such as children’s Zyrtec or Claritin, will help relieve symptoms. Also, nose sprays, like children’s Flonase or Rhinocort, can bring relief. In addition, Dr. Karnani suggests parents help reduce their child’s exposure to allergens by staying indoors when the pollen count is high, closing windows and running the air conditioner, and showering each night to rinse off the pollen. Lyndsey Frey is a freelance writer based in Cleveland, Ohio. She specializes in blogging and content publishing, search engine optimization and social media marketing. Her work has been published online and in regional and national publications, such as Inside Business, Cleveland, Akron Life and Internet Retailer magazines.